Heritage Cadillac awards Feral Fixers $500! Feral Fixers was the winner in the recent Heritage Cadillac Facebook contest - and took home the prize of $500! Many thanks to all of you who voted 'early and often' and carried us to victory! Special thanks to Julie Steineke for going 'above and beyond' and rallying people to vote for us. Feral Fixers Volunteers Sue, Debbie, Julie and myself (Ted) went to Heritage Cadillac this past Thursday for a quick photoshoot and to pick up the check. The people at Heritage Cadillac could not have been nicer! And, to top it off, the person at Heritage taking the photographs is related to one of our Fosters - it's all in the family! 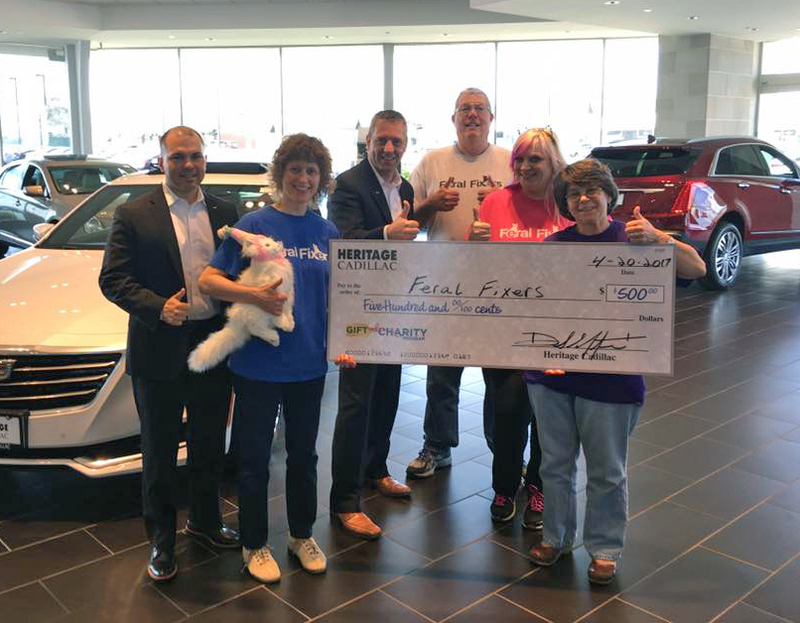 Thanks again to Heritage Cadillac for sponsoring this contest and awarding Feral Fixers the $500. Heritage has posted all of the pictures on their Facebook page. And, don't forget - Feral Fixers is currently in the running for another $500 Facebook contest prize, this one from Bill Kay Nissan. We have won two of these contests now - let's make this one the third!